By accessing this website (“RainAway Under Deck Systems Website”) you agree to be legally bound by these Terms & Conditions / Disclaimer (“Terms & Conditions”). Please also consult the applicable additional legal information for your relevant country if needed. If you do not agree to these Terms & Conditions, do not proceed to additional web pages of the RainAway Under Deck Systems Website. These Terms & Conditions as well as the information and materials contained throughout the RainAway Under Deck Systems Website are subject to change from time to time without notice. The last line of these Terms & Conditions indicates the date of its last update. The RainAway Under Deck Systems Website and all information and functionality contained within it are not directed at or intended for use by any person resident or located in any jurisdiction where (1) the distribution of such information or functionality is contrary to the laws of such jurisdiction or (2) such distribution is prohibited without obtaining the necessary licenses or authorizations and such licenses or authorizations have not been obtained. Products and services displayed on the RainAway Under Deck Systems Website may not be eligible for sale or available to residents of certain states, countries or certain categories of investors. Any materials available on the RainAway Under Deck Systems Website have no regard to the specific investment objectives, financial situation or particular needs of any specific recipient. Any documentation or reporting available on the RainAway Under Deck Systems Website is published for informational purposes only and is not to be construed as a solicitation or an offer to buy or sell any securities or related financial instruments. Unless specifically stated otherwise, all price information is indicative only. No representation or warranty, either express or implied, is provided in relation to the accuracy, completeness or reliability of the materials, nor are they a complete statement of the securities, markets or developments referred to herein. 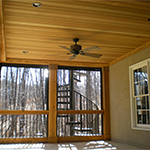 RainAway Under Deck Systems is not under any obligation to update or keep current the information contained herein. 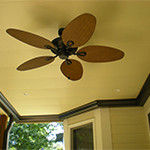 The information contained in the RainAway Under Deck Systems Website is for informational purposes only. No information published on the RainAway Under Deck Systems Website constitutes a solicitation, an offer, or a recommendation to buy or sell any investment instruments, to effect any transactions, or to conduct any legal act of any kind whatsoever. RainAway Under Deck Systems does not intend to provide investment, legal or tax advice through the RainAway Under Deck Systems Website and does not represent that any securities or services discussed are suitable for every investor. The RainAway Under Deck Systems Website may contain statements that constitute “forward looking statements”. 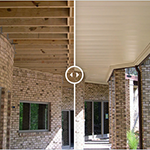 While these forward looking statements may represent RainAway Under Deck Systems’s judgment and future expectations, a number of risks, uncertainties and other important factors could cause actual developments and results to differ materially from RainAway Under Deck Systems’s expectations. RainAway Under Deck Systems is under no obligation to (and expressly disclaims any such obligation to) update or alter its forward looking statements as a result of new information, future events, or otherwise. The information and materials contained on the RainAway Under Deck Systems Website are provided “as is” and “as available”. RainAway Under Deck Systems makes no representations or warranties of any kind, either express or implied, with respect to the information and functionality contained in the RainAway Under Deck Systems Website, including but not limited to warranties of title, non-infringement, merchantability or fitness for a particular purpose. Without limiting the foregoing, RainAway Under Deck Systems does not warrant the accuracy, timeliness, completeness, reliability or availability of the RainAway Under Deck Systems Website or the information or results obtained from use of the RainAway Under Deck Systems Website, or that the RainAway Under Deck Systems Website is virus-free or error-free. To the fullest extent permitted by law, in no event shall RainAway Under Deck Systems or any of its directors, employees or agents have any liability whatsoever to any person for any direct or indirect loss, liability, cost, claim, expense or damage of any kind, whether in contract or in tort, including negligence, or otherwise, arising out of or related to the use of all or part of these web pages, even if RainAway Under Deck Systems has been advised of the possibility of the same. The RainAway Under Deck Systems Website may contain third party content or links to third party websites. These content and links are provided solely for your convenience and information. 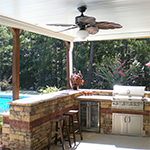 RainAway Under Deck Systems has no control over, does not assume any responsibility for and does not make any warranties or representations as to any third party content or websites, including but not limited to, the accuracy, subject matter, quality or timeliness. RainAway Under Deck Systems shall have no liability for third party content or websites or websites linking to or framing the RainAway Under Deck Systems Website. The RainAway Under Deck Systems Website may contain Social Sharing options which are identifiable by means of respective buttons on certain posts or pages within the RainAway Under Deck Systems Website. Social Sharing allows users of certain social media platforms to post links of selected RainAway Under Deck Systems web pages or blog posts on their corresponding social media profiles in order to bookmark them or share them with their social media contacts. If you engage in Social Sharing you will be sending identifying data to the respective social media platform, irrespective of the RainAway Under Deck Systems Website. Any comments or activity arising from persons using Social Sharing is not controlled, endorsed or monitored by RainAway Under Deck Systems and RainAway Under Deck Systems will not be held responsible or liable for such. Any persons who share RainAway Under Deck Systems communications or information via Social Sharing are not authorized to act as an agent of RainAway Under Deck Systems, to speak for or represent RainAway Under Deck Systems and their views and opinions must be regarded as strictly their own and not RainAway Under Deck Systems’s. In addition, the provisions in these Terms & Conditions relating to Links also apply to Social Sharing. RainAway Under Deck Systems retains all rights, title and interest (including copyrights, trademarks, patents, and any other intellectual property or other right in any form) in all information and content (including all text, data, graphics and logos) on the RainAway Under Deck Systems Website. Individual pages and/or sections of the RainAway Under Deck Systems Website may be printed for personal, educational, or internal use only, and provided that such print-outs retain all applicable copyright or other proprietary notices. All users must not, without limitation, modify, copy, transmit, distribute, display, perform, reproduce, publish, license, create derivative works from, transfer or otherwise use in any other way for commercial or public purposes in whole or in part, any information, text, graphics, images, video clips, directories, databases, listings or software obtained from the RainAway Under Deck Systems Website without the prior written consent of RainAway Under Deck Systems. Systematic retrieval of content from the RainAway Under Deck Systems Website to create or compile, directly or indirectly, a collection, compilation, database or directory (whether through robots, spiders, automated devices or manual processes) or creating links from the RainAway Under Deck Systems Website without written permission from RainAway Under Deck Systems, Inc. is prohibited. All marks and logos on the RainAway Under Deck Systems Website are property of RainAway Under Deck Systems, Inc. and should not be altered or disseminated without express written consent of RainAway Under Deck Systems, Inc. Unless explicitly stated otherwise, RainAway Under Deck Systems does not accept any orders or instructions sent by E-mail or any other electronic messaging system. RainAway Under Deck Systems shall not be liable to you or any third party for damages incurred in connection with any messages sent to RainAway Under Deck Systems using ordinary E-mail or any other electronic messaging system. Certain web pages or areas on the RainAway Under Deck Systems Website may contain additional terms, conditions, disclosures and disclaimers (together “Additional Terms”). In the event of a conflict between these Terms & Conditions and the Additional Terms, the Additional Terms will govern for those web pages or areas.